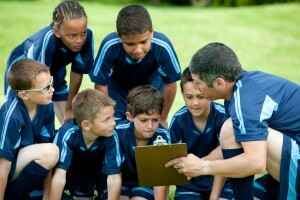 Learn how to become an excellent youth soccer coach. Being a coach for a youth soccer team is not just about making sure your team wins games. You’ll need to act as a role model, a sports coach and someone who assists in the personal development of the kids you work with. It’s your job to make sure that you’ve done more than just order soccer uniforms and this guide will provide you with the skills and inspiration you need to remain focused and dedicated to your work. As a coach, you’re acting as a leader and mentor. Your role is someone who needs to help and provide discipline, which is often a tough balance to strike. One tactic is to utilize teaching examples. You can create some kind of MVP program within your team, with the reward being a Diadora soccer gift card, to encourage development. You can replay games filmed by parents from the sidelines to see what could be done better and more efficiently. You can also act as a role model in other ways, like encouraging your team to volunteer. You’re in charge of most aspects of your team, from the soccer t-shirts they’ll wear to how they prepare for a game mentally. You can’t change how your kids operate at home, but you can give them some tools to help them out on the pitch. For example, a team mantra can provide some great self esteem before a game. Maybe you have a cheer or a saying you can use to get everyone hyped for the game. You can also recognize players in small ways (such as patches with their position, or their nickname). Remember, kids love to be unique so you should try and use that to your advantage. Teamwork is that crucial bit that keeps the team functioning and makes everyone feel like they have purpose on the pitch. Team building is the name of the game for improving teamwork. Take the kids out paintballing, or try and build something together. Volunteering, which was mentioned above, is another excellent team builder. Especially when kids are paired off into groups. The key to improving teamwork is to put your players into situations where they must work together. There will be natural divisions in the squad, as not everyone will get along originally. After team building, you’ll be surprised at the length your teammates will go for one another on the pitch. Soccer Garage features incredible deals on the top brands in soccer, with international shipping available.